P.C. 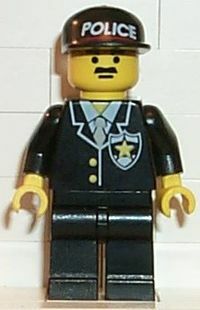 Bobby is a LEGO minifigure that appears in two identical Police station sets in 1998 and 2002, however his most notable appearance is in the video game LEGO Racers 2. He drives a black, compact police car. He is the last of the four racers that the player must race against on Sandy Bay, before moving on to any other world. P.C. Bobby was also one of the other residents on Sandy Bay that ridiculed Workman Fred for his boastful comments. The player races P.C. Bobby after they defeat Fireman Gavin, after the player defeats P.C. Bobby, the player is finally able to move onto another world, but due to the limit of Gold Bricks immediately available, this first world that they must travel to is inevitably Dino Island. On Sandy Bay races in Free Play mode, P.C. Bobby's police car is driven by Johnny Thunder, but can also be driven by the player. This page was last edited on 2 July 2016, at 18:27.